“VICTORIA — A former B.C. Liberal MLA now working as a director at Simon Fraser University has been giving public dollars from his university expense account to the B.C. Liberal Party. 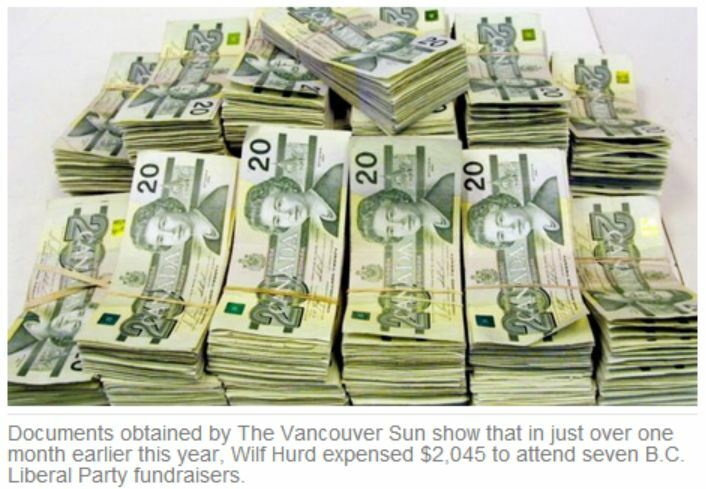 Documents obtained by The Vancouver Sun show that in just over one month earlier this year, Wilf Hurd expensed $2,045 to attend seven B.C. Liberal Party fundraisers. The payments included $1,000 for six tickets to an event put on by Liberal MLA and former cabinet minister Harry Bloy, $350 to attend an event by Liberal MLA and deputy Speaker Linda Reid as well as various others from mid-January to late February. Hurd, who is the university’s director of government relations, paid for the events with personal cheques and then submitted the charges to the university for reimbursement. Each day seems to get worse for Christy and the BC Liberals. Hopefully the voters will do the right thing come election NEXT YEAR! and throw them out. I hope the CRA is paying attention. The Liberal party say's it will give the money back. But did Wilf Hurd file & receive a tax credit in those years ? Can the same political money laundering be applied to the millions the Liberal's receive from Oil & Gas companies in return for subsidies ? Since there is no effective oversight at SFU preventing this fraud, we also need to ask if it was approved by upper management. Who else is doing the same? In my career, I approved many expense claims but I always examined them to ensure appropriateness. Apparently SFU approved of this scam or paid no attention to it. Either way, the approving officer should be fired. Campbell thieved and corruptly sold, an entire railroad, our BCR, and all of the priceless Real Estate with it. Hurd's infraction of money laundering, seems a drop in the bucket, to the real thieving, deceiving, lies and corruption, we have put up with, for over twelve years. It's a little too late for the media to take concern now. They are a disgrace to their professions, only too happy to spread the, Campbell/Clark BC Liberals crap, far and wide. Where were they, when all of Campbell's thieving and corruption was going on? They were biased against the people, and that is unforgivable. It will be, a frosty Friday in hell, before I will ever trust them again.